We have published two new hikes in the Picos de Europa, the undisputed highlight of the Cantabrian Mountains. Coriscao is a summit of over 2,235 metres that thanks to its very privileged position and relative prominence is one of the best balconies on the Picos de Europa. This very varied hike close to the border with Navarre and France takes us to the Pico Sobarcal, a peak from where the views are just unequalled. This circular route through the heart of the Macizo Central of the Picos de Europa, shows us various faces of this great mountain range. This hike takes us through spectacular high mountain scenery to the Mulhacén, with 3,479 metres the highest summit of the Iberian Peninsula. 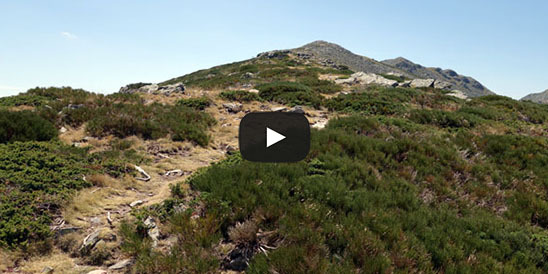 The hike takes us through the great dry rugged landscape of the Circo de Gredos to Almanzor, with its 2,592 metres the highest peak of the Sistema Central. This hike in the heart of the Garibaldi Provincial Park in Canada with views over the Garibaldi Lake and the surrounding snowy landscape is breathtaking. The Lucero is one of the most beautiful peaks of the Sierra de Almijara and the ascent to this summit through a breathtaking barren rocky landscape is a true classic. Peñalara is with 2,428 metres altitude the highest mountain of the province of Madrid and one of the most important and spectacular peaks of the Sierra de Madrid. On this site you can find walking routes through the best walking regions, nature parks and mountain ranges of North, Central and South Spain and Portugal. With our free route descriptions that you can download as PDF or GPX file for your GPS device you make circular routes or round trips through the most beautiful mountains and nature. You walk to peaks and summits with impressive panoramas and during the hikes you often have wide views over valleys and mountain formations. All trekking routes have been captured with photos, pictures and videos.